Title : Decretals of Gregorius IX. Date : Italy, probably Bologna 1350-1380. Size : 17.5 x 11.1 inches. / 44.5 x 28.2 cm. 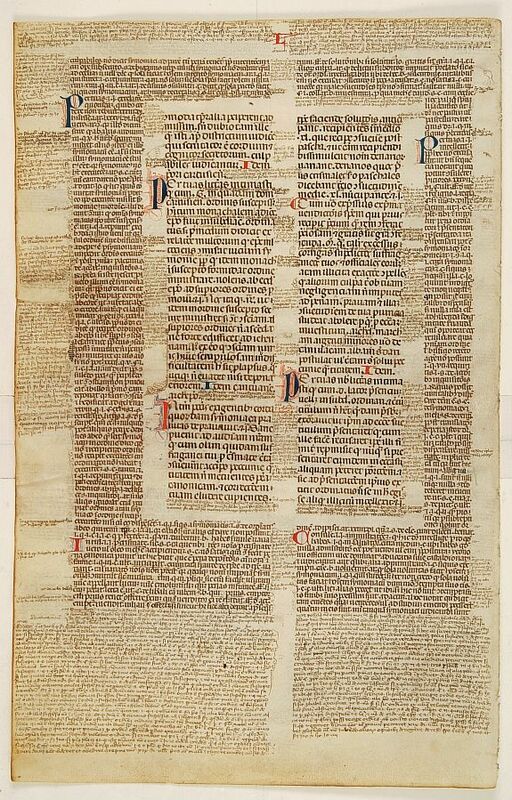 Description :Very important leaf with the text of Gratians "concordantia discordantium canonum" , written in 1140. Meaning Harmony of dissonant canones. It contains text of popes and the Patriarchs, these pronouncements are called "decretals". In 1234 appeared the so-called "Decretales Gregorii IX" or the "liber extra" and were sent by the pope to Bologna university. It was meant to strengthen the authority of the pope. These decretals contained texts of popes, patriarchs and texts of councils . Gratianus wrote his text in short "dicta", about the contraversities, and clearly ordened the "canones". Bishops from all over Europe brought their problems to the pope and he let his advisors, as delegated judges, pass judgement on these. These judgements are called "decretials" . This enlarged largely the papal authority. One large initial in blue and red on recto, and five large initials of same on verso. This leaf was written in Italy, early 14-th century, most probably in Bologna .With slightly later explanations in the margins. In good condition, with very important text. Condition : In good condition, with very important text. Leaf in manuscript, in latin written on vellum.